Our floors upstairs are officially stained! We went dark! 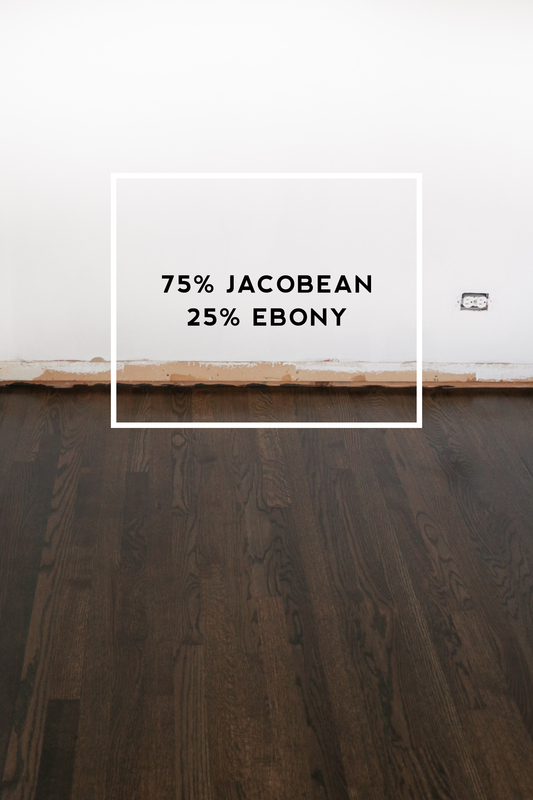 Despite everyone warning me about dark floors being very hard to keep clean, we ended up going with the 75% Jacobean + 25% Ebony (the lighter of the 2 dark browns). Sorry but I had to!!!!!! I genuinely appreciated all of your Instagram messages offering your input/experiences with dark floors though. And who knows, I may kick myself later. But, I only live once. And in my gut, in my heart, burning in the depths of my soul, lives an obsession with dark floors and white walls. SO I WENT FOR IT. Time to get a Roomba! For real though, thank you for all of your DM’s and feedback. It was so awesome being able to bounce ideas off of people, ask questions, and learn so much about floor stain from everyone who has been through this! I’m so excited to do that with the rest of this house process. And, I’m really grateful for the heads up about what a biotch dark floors can be, at least I am mentally prepared. Truly, thank you! 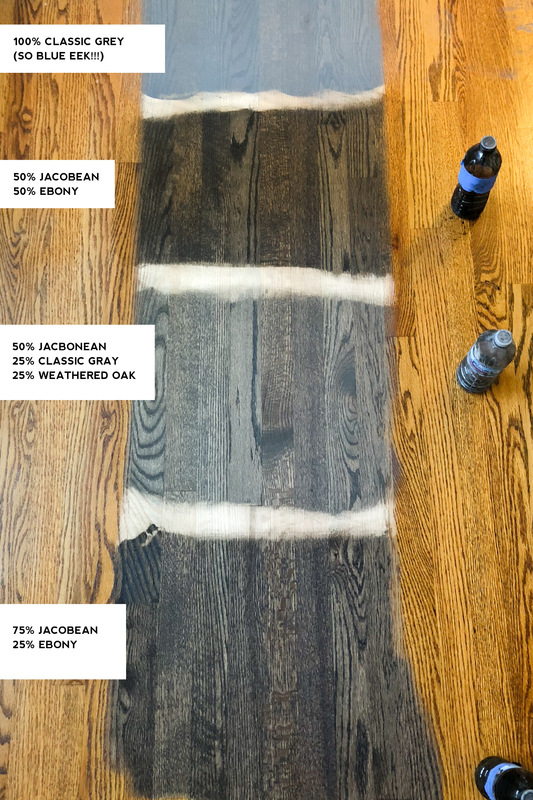 Below are some before + after photos, and examples of other stain colors we considered! 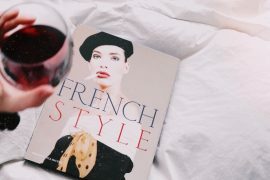 I’m working on a “white paint post” where I will talk more about my paint journey. But we did decide to go with both Benjamin Moore Simply White and White Dove throughout the house. 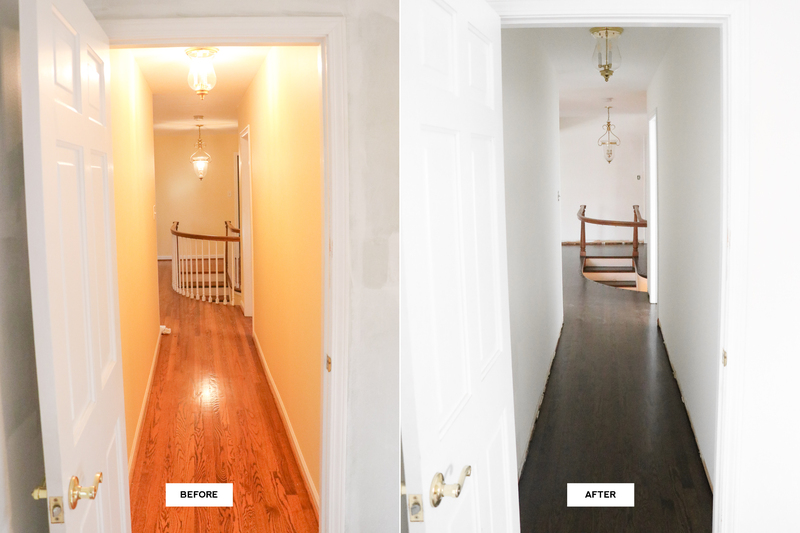 The hallway shown above is Simply White but I’ll have better photos + more on that in my post to come! 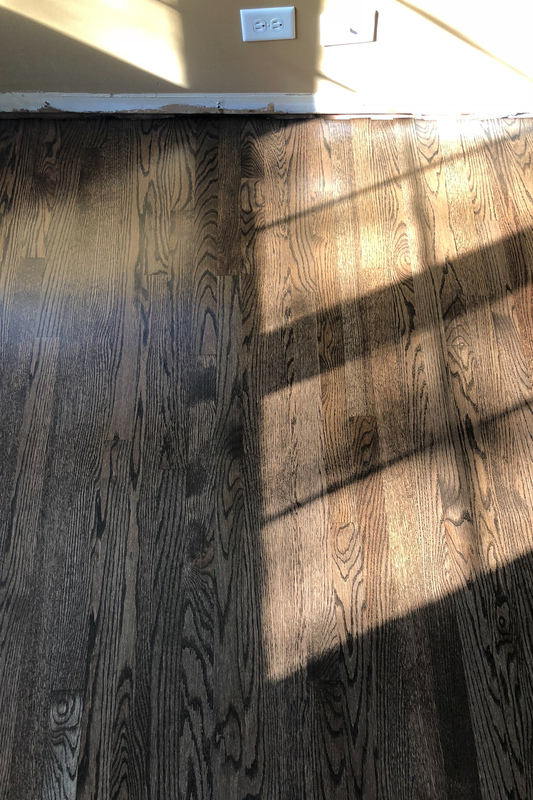 I considered leaving the wood floors raw because I really do love the natural oak color so much. However, I just couldn’t get myself to pull the trigger! When I close my eyes and imagine the house finished, the floors are dark. 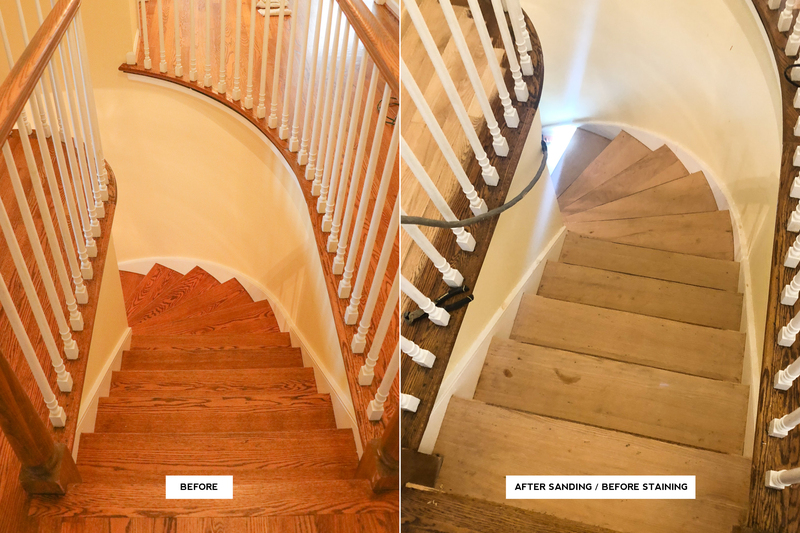 Just an FYI staircases are tricky when it comes to staining. We were quoted an extra $1200 just to have the hand rails and banisters stained! 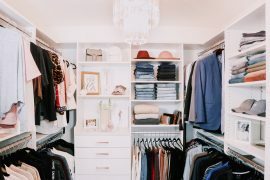 We passed on having the pros do it and we’re going to do it ourselves with the help of my parents. 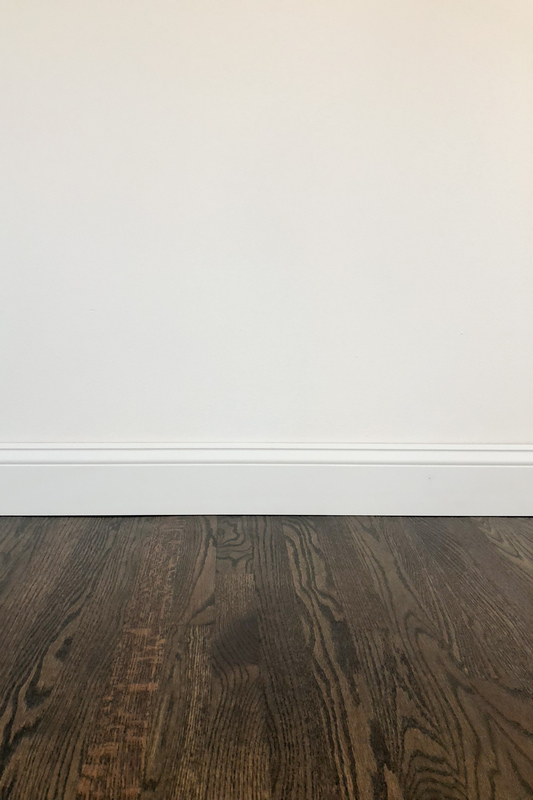 Originally, we had the guys leave the spindles and sand + stain around them, which is tedious because it is hard to get a smooth finish in the spots in between the spindles. As expected, there was dark stain all over our white spindles, which was fine because we had planned on repainting them white ourselves later anyway. However, the stain job was WAY too goopy and chunky in some spots in between the spindles. So, we had my dad remove them for us and the stain guy came back and re-did the staircase for free. 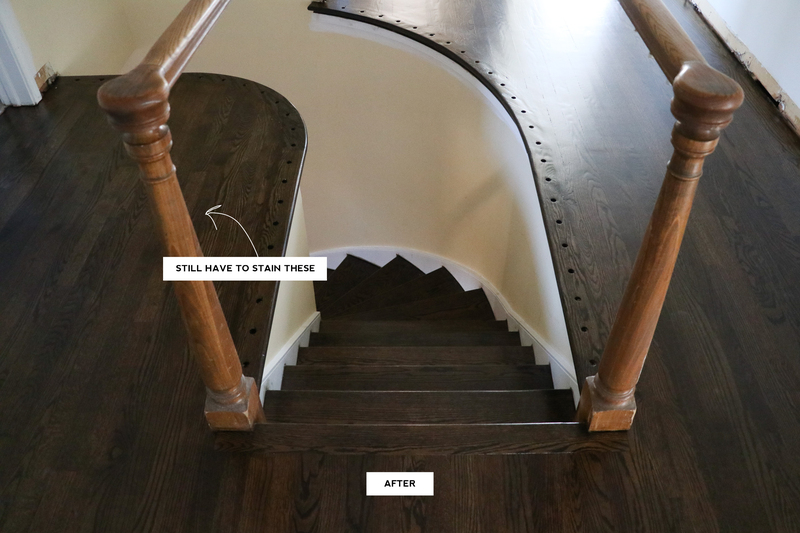 ***BOTTOM LINE: Remove the spindles removed BEFORE getting your staircase stained! Here are the other stains we considered! Okay so the “classic grey” is basically blue, just a heads up. The 50% Jacobean + 25% Classic Grey + 25% Weathered Oak was beautiful but I couldn’t commit because I still got a slightly blue vibe in certain lighting. 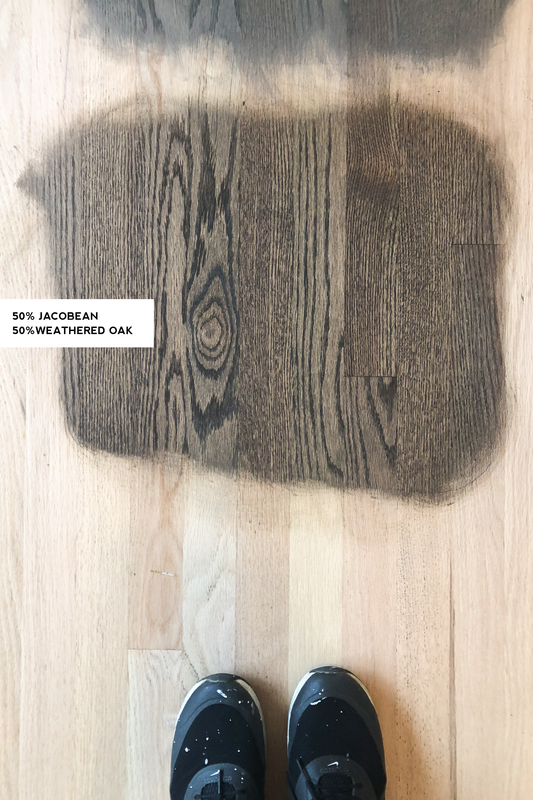 I was SO close to going with the 50% Jacobean + 50% Weathered Oak, it was gorgeous and a great option if you want a light dark (if that even makes sense!). Leave any questions in the comments! 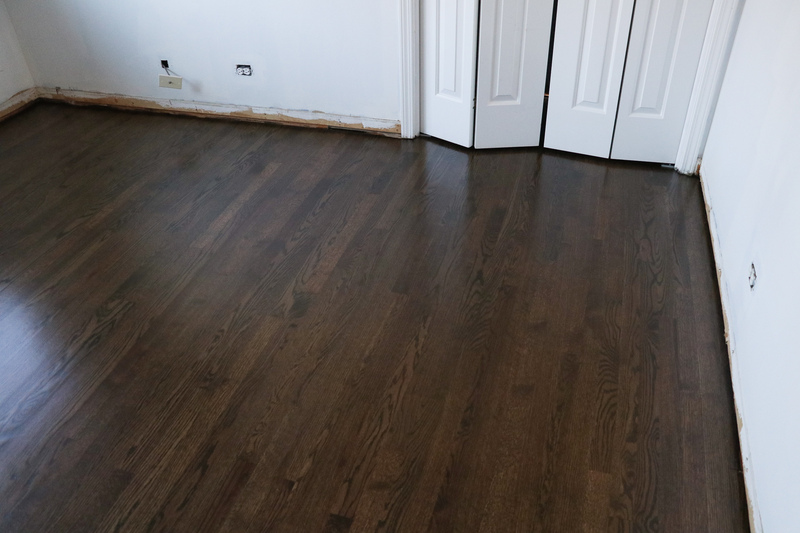 Happy to tell you more about our experience with staining the second floor! Awesome combo! We have all Jacobean and sometimes I wish it was darker, the hint of Ebony was such a good choice!